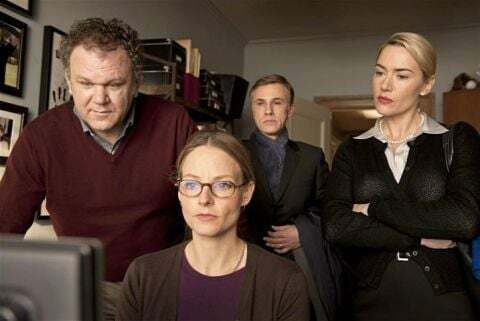 Carnage is pitch-perfect comedy directed by the very skilled Roman Polanski and starS 4 amazingly talented actors: Kate Winslet, Christoph Waltz, Jodie Foster and John C. Reilly. Carnage may sound like a tedious film on paper, four actors in one room/area for the length of the film, with the only outside interference coming from the occasional phone call. It’s both a comedy and a drama, providing you with a first class look at the breakdown of general human behavior. It works wonders as a comedy, with veteran funny man John C. Reilly keeping the mood light and fun, but it’s not afraid to break loose and let the normally serious Kate Winslet, Jodie Foster and Christoph Waltz in on the action. Carnage is both extremely funny and downright interesting and hard to stop watching because of how it touches up on so many emotions, ideas and the basic nature of how humans function. Only Roman Polanski could make something like this work. Penelope (Jodie Foster), Michael (John C. Reilly), Nancy (Kate Winslet) and Alan (Christoph Waltz) are four adults with a common interest. Their kids participated in a playground fight earlier in the day and they’ve decided to act like responsible adults and settle it in person. Their initial goal is to write up a document outlining the events and then possibly scheduling a meet up for the two boys to patch things over. It’s all real simple and well-mannered, but then one things leads into another and it becomes an all-out war ranging from marriage discussions, moral codes and even something as innocent as the morality of letting a pet hamster out into the wild. Carnage covers all the bases of human interaction, emotions and reasoning. It touches up on just about everything, from polite and civilized beings to the cruel reality of human nature. It breaks down just about every perspective in its brisk running time and it does it all in one location with four key actors. Only such a skilled director like Roman Polanski could make a film like this appeal to the masses. Carnage sounds like an odd film on paper, but it works effectively on the big screen. It’s both a comedy and a drama without sacrificing one genre for the other. Polanski keeps the film focused and tight, not once making it feel difficult to watch or too boring to sit through. If I had only one complaint about the film it would be that it ends. Obviously all films need to end, but Carnage feels like something that ends simply because it had to, otherwise we’d be watching it all day. I’d very much like to continue watching the couples argue, but I’m glad Polanski cut it off when he did. Nothing ever gets too drawn out or stale. Each and every character feels like they have something valid to say and they continue to discuss matters until the very end. It should be no surprise that Reilly, Foster, Winslet and Waltz are all on the ball. Each one brings their own brand of both humor and drama. Reilly transitions the best, but Waltz seems to be naturally laid back. Foster and Winslet have the biggest range of emotions, going from rational and patient to completely drunk and insane. It’s a blast watching them all sort of let loose in the film and the strong chemistry between the four helps keep the film from going off the tracks. Carnage comes to Blu-Ray with a well-balanced 1080p video transfer that absorbs all of the fine detail of the apartment the film takes place in. Colors are on the darker side with lots of grays and tans, but the brighter reds and yellows have no problem standing out. Textures and skin tones have a certain level of clarity that is both revealing and structured. The film comes with a 5.0 DTS-HD Master Audio track. It is missing the .1 for the subwoofer channel, but it feels very much like a staged performance. Dialogue is loud and clearly understandable. While there isn’t much activity coming out the back channels it should be noted that everything has a general dynamic feel to it. When they shift positions in the room or hallway the channels act accordingly. Roman Polanski‘s Carnage is an impressive effort both for him as a director and his four main cast members as actors. It goes to show you that you can make a dramatic comedy in the confines of one apartment building without any outside interference. Not once do you feel the need to want to see the characters leave the room. It’s an hour and thirty minutes of pure character work by some of the best actors working in the field. Polanski’s direction keeps things fun and light when they need to be and somewhat depressing and dark when the moment calls for it. The Blu-Ray disc looks sharp and displays lots of striking dark colors. The audio might not sound all that good, but it’s as good as it’s going to get for this sort of film. The only real bummer here is the mostly short special features, with one lengthy one giving us a real good look at the men in the film. The film alone is worth the purchase, but those who prefer loaded discs might want to wait for this to drop in price.